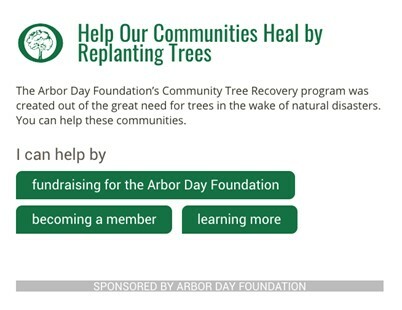 Arbor Day is excited to provide a widget to insert which empowers readers to get directly involved in the Arbor Day Foundation’s Community Tree Recovery Program. Please see instructions at the bottom of the press release for more details. PANAMA CITY, Fla., January 14, 2018 /3BL Media/ — The Arbor Day Foundation along with the Florida Forest Service, Verizon, FedEx, International Paper and Texas Roadhouse will kick-off Florida’s state Arbor Day with tree planting and distribution events on Friday, January 18 in Panama City and Marianna. The tree plantings and distributions are part of the Arbor Day Foundation’s Hurricane Tree Recovery campaign—a public and private partnership aimed at distributing free trees to residents in communities affected by recent hurricanes. More than 1,000 trees will be given away free of charge to residents of Panama City and Marianna to help replace trees damaged and destroyed by Hurricane Michael. The Panama City event will be held on Friday, January 18, 2019 at 1:00 p.m. at Florida State University-Panama City, 4750 Collegiate Dr., Panama City, Florida, 32405 in the overflow parking lot. Students from Florida State University will help plant large trees on campus along with leadership from the Florida Forest Service, Arbor Day Foundation, International Paper, Verizon and Texas Roadhouse in an effort to immediately help reestablish lost tree cover. Residents can select a free tree from one of the following species: river birch, redbud, black gum, sand live oak and baldcypress. The Marianna event will be held on Friday, January 18, 2019 at 9:00 a.m. at Chipola College, 3094 Indian Cir., Marianna, Florida, 32446. Tree species include river birch, winged elm, red maple, baldcypress, southern red oak, live oak, pignut hickory, yellow poplar and redbud. In October 2018, Hurricane Michael made landfall in the Florida panhandle, leaving a path of devastation in hundreds of communities. Hurricane Michael was one of the most destructive hurricanes to make landfall in the United States, causing more than $14 billion in damage total, with $1.3 billion in forest loss in over 200 Florida communities. The Hurricane Tree Recovery campaign was created following the hurricane devastation in Texas, Florida and Puerto Rico in August and September of 2017. The following year, Hurricane Michael made landfall in the panhandle of Florida. The hurricanes destroyed millions of trees in yards, parks and forests across the states and territory. For more information, or to see how you can donate or get involved with the Arbor Day Foundation’s hurricane tree recovery campaign including helping those recently affected by Hurricane Michael, please visit arborday.org/hurricanes. About the Arbor Day Foundation: Founded in 1972, the Arbor Day Foundation has grown to become the largest nonprofit membership organization dedicated to planting trees, with more than one million members, supporters, and valued partners. Their vision is to help others understand and use trees as a solution to many of the global issues we face today, including air quality, water quality, climate change, deforestation, poverty and hunger. As one of the world's largest operating conservation foundations, the Arbor Day Foundation educates and engages stakeholders and communities across the globe to involve themselves in its mission of planting, nurturing and celebrating trees. More information is available at arborday.org. About the Florida Forest Service: The Florida Forest Service, a division of the Florida Department of Agriculture and Consumer Services, manages more than 1 million acres of state forests and provides forest management assistance on more than 17 million acres of private and community forests. The Florida Forest Service is also responsible for protecting homes, forestland and natural resources from the devastating effects of wildfire on more than 26 million acres. Learn more at FloridaForestService.com. About Verizon: Verizon Communications Inc. (NYSE, Nasdaq: VZ), headquartered in New York City, generated $126 billion in 2017 revenues. The company operates America’s most reliable wireless network and the nation’s premier all-fiber network and delivers integrated solutions to businesses worldwide. Its Oath subsidiary reaches people around the world with a dynamic house of media and technology brands. About FedEx Corp.: FedEx Corp. (NYSE: FDX) provides customers and businesses worldwide with a broad portfolio of transportation, e-commerce and business services. With annual revenues of $67 billion, the company offers integrated business solutions through operating companies competing collectively and managed collaboratively, under the respected FedEx brand. Consistently ranked among the world’s most admired and trusted employers, FedEx inspires its more than 425,000 team members to remain focused on safety, the highest ethical and professional standards and the needs of their customers and communities. To learn more about how FedEx connects people and possibilities around the world, please visit about.fedex.com. About International Paper: International Paper (NYSE: IP) is a leading global producer of renewable fiber-based packaging, pulp and paper products with manufacturing operations in North America, Latin America, Europe, North Africa, India and Russia. We produce corrugated packaging products that protect and promote goods, and enable worldwide commerce; pulp for diapers, tissue and other personal hygiene products that promote health and wellness and papers that facilitate education and communication. We are headquartered in Memphis, Tenn., and employ approximately 52,000 colleagues located in more than 24 countries. Net sales for 2017 were $22 billion. For more information about International Paper, our products and global citizenship efforts, please visit internationalpaper.com. About Texas Roadhouse: Based in Louisville, Kentucky, Texas Roadhouse opened its doors in 1993 and has more than 525 locations in 49 states and eight countries. The family-friendly restaurant is famous for hand-cut steaks, made-from-scratch sides, fresh-baked bread, and a lively atmosphere. Texas Roadhouse was consecutively voted #1 Steak by Nation’s Restaurant News Consumer Picks Survey in 2015 and 2016. In 2017 and 2018, Forbes Magazine recognized the company as one of America’s Best Large Employers. For more information, visit https://www.texasroadhouse.com/. Help Readers get Involved- Arbor Day is excited to provide a widget to insert which empowers readers to get directly involved in the Arbor Day Foundation’s Community Tree Recovery Program. It also benefits the publisher by driving reader engagement and time on the article. Instructions- Use the iframe below to embed this widget- inside the iframe you can adjust the width and height parameters, we recommend width at 100% for optimum viewing on all device types. Please contact Public Good with any questions or alternative implementation options at media@publicgood.com or 773 343 6522.